The Samsung Gear S2 smartwatch app Tide Table Chart provides quick and easy access to high tide and low tide forecasts. 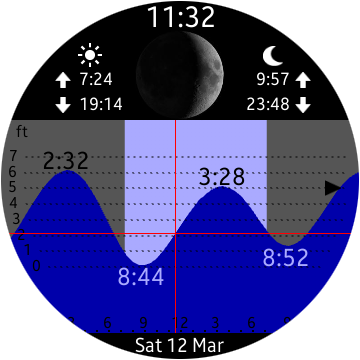 Rotate back / forward for high and low tides of the next day or tap the Play button to run an animation of moon phase and tide changes for a quick overview. This Gear S2 app can be used without connection to your phone. But you should run the Android phone app Tide Table Chart once per week to update the tide data on your watch. Sorry, Samsung does not support Web links to Gear apps. Please open on your phone the Gear Manager app and search there for Tide Table Chart.